What Came First, The Silverfish Or The Moisture Problem? This age-old question of, "Which came first, the chicken or the egg," can be debated ad infinitum without anyone coming to a conclusion--at least not a conclusion that everyone will agree upon. The fact of the matter is, some things are simply not knowable--at least not for us lowly humans anyway. But, the question of, "Which came first, the silverfish or the moisture problem," is one we're pretty sure we can tackle. Let's take a look. If you are seeing silverfish in your home, that means they got in somehow. And if they got in somehow, this means they first had to come in close to your house. So our first question for this article is, "What attracts silverfish to our yards and up close to our homes?" The short answer is: moisture. Here are some of the conditions which attract silverfish. Wet leaf piles. Silverfish love to hide out under wet leaves. Weedy areas. Especially if there is trapped moisture, this is a haven for silverfish. Firewood, construction materials, or other wooden objects lying on the ground. Silverfish will hide underneath these, especially if the ground is moist. Anything else that is moist underneath. Mulch. Mulch is famous for trapping moisture. And if you have damp mulch up against your home, then silverfish will come right in close. Leaky spigots and damaged or blocked gutters. If water is collecting near your foundation, it will make your soil wet and attract moisture-loving pests such as silverfish. If silverfish are close, they will look for a way in. And, if wood has been moistened, then it is more likely that pests will find their way inside. Gaps, cracks, and holes in foundations and walls will be made bigger by chewing animals and insects such as mice, rats, and termites. The more moisture, the more moisture damage, the more holes--and the more pests will get in. So What's The Big Deal About A Few Silverfish? Silverfish are not just creepy looking insects that startle you when you step out of the shower, they actually cause damage to belongings. These creatures will nibble on everything from dandruff to dead skin, and fabrics to bedding and clothing items. They also eat paper products such as newspapers and important documents. Probably the most disturbing item silverfish destroy is old photos, which may be irreplaceable. Old books, wallpaper, and food items can also be damaged, destroyed, or tainted by silverfish. Remove any leaf piles or other debris that might be a harborage for silverfish and other pests. If you have wood piles, construction materials or other wood resting on the ground, either remove it from your property or make sure it is stored well away from your foundation and walls, and keep it up off the ground. Make sure the area around your foundation perimeter is allowed to dry out after wet weather. If you have vegetation close to your home, trim it back. If you have areas that have excessive shade and do not dry out well, make sure there is good airflow, and, if possible, create conditions to allow the sun to hit it so it will dry out better. If you have mulch around your perimeter, consider removing it, moving it back at least two feet or replacing it with a dryer material such as crushed rock. Make sure your foundation and walls do not have gaps, holes, or cracks where pests can squeeze through. Do a detailed inspection and seal up any openings you find. Dry up inside areas of your home. If silverfish get in, make sure the environment is uncomfortably dry for them. Using fans and/or dehumidifiers in moist/humid areas is an excellent strategy for this. Which came first, the silverfish or the moisture problem? Most likely the moisture problem came first. And while we may not be able to repair your home of moisture damage, we certainly can get rid of silverfish. 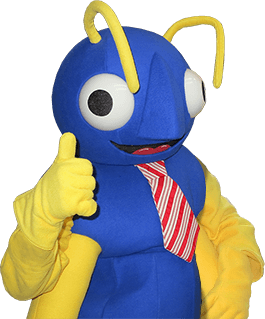 Big Blue Bug Solutions has been eradicating pests for home and business owners since 1935. Let us take care of your silverfish problem. Call Big Blue Blug Solutions to learn more about our residential pest control services.